Soft pretzels bring back memories of childhood. In the early 90's, I loved going to see the Expos play - not because I loved baseball - but because I knew that it meant that I'd get to drink orange soda and share a soft pretzel with my dad. When the Expos decided to pack up and leave the city, I knew that my soft-pretzel eating days were over. Sure, they sometimes had them at the Hockey games, but they just weren't the same. Unlike in the States, good soft pretzels are hard to come by up here in Canada, and each one that I've had has only been mediocre. 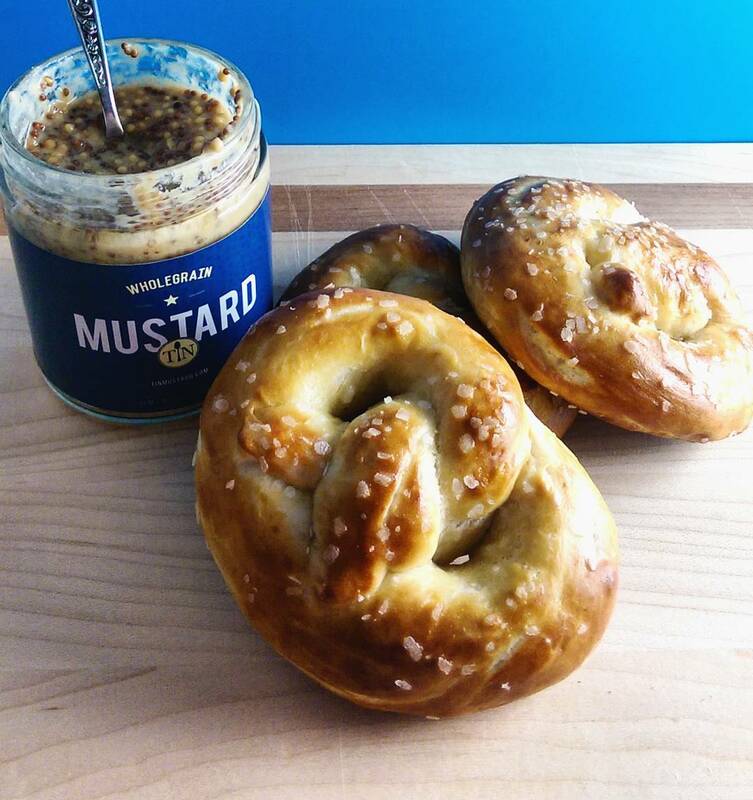 I was originally going to say that my recipe will help you re-create the kind of soft pretzels that you get at the mall - but that would be a lie. It would be a lie because these pretzels are SO much better than mall pretzels. The melt-in your mouth fluffy goodness combined with the satisfaction of knowing that you made them yourself may just create the perfect pretzel. Now, you're likely visiting my blog today because you're wondering: how do I make soft pretzels?! The method is indeed quite simple, an easy task even for novice bakers. First, you proof your yeast (let it sit for 10 mins in lukewarm liquid). Then, you stir in the flour, a bit at a time, until it forms a shaggy dough. Third, you knead for a few minutes, until it all comes together and looks relatively smooth. Let it sit for a bit to rise, and then onto the shaping and baking! There are more details in the recipe down below as I walk you through each step. This recipe is relatively quick - in that it only takes one hour to rise, a few minutes to shape, and 10 minutes to bake! Hands on, you're probably looking at no more than 15 to 30 minutes, depending on your level of dough kneading experience. Mix the salt with the flour and set aside. Heat milk to body temperature (no more than 100F, you should be able to stick your finger comfortably inside) and pour into a large glass or ceramic bowl (avoid metal, as it is reactive with yeast.) Add sugar and yeast and mix lightly with a fork or whisk. Add softened butter and half of the flour. Stir with a wooden spoon or spatula. 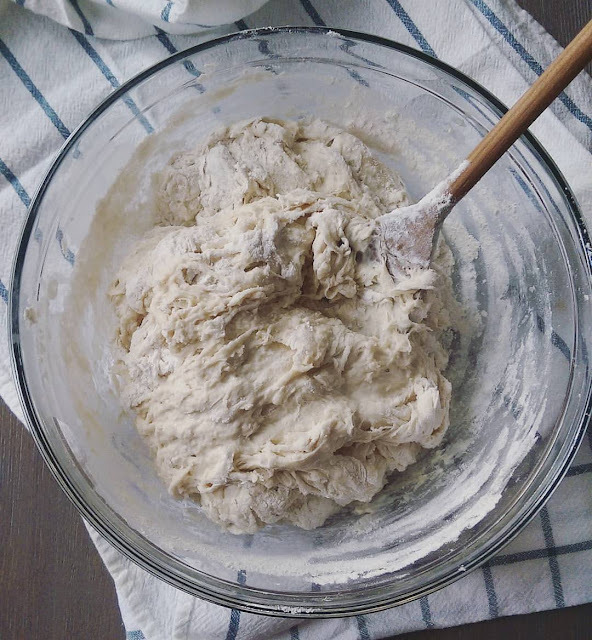 Add in remaining flour and mix by hand until a shaggy dough forms. Knead in the bowl or on your counter for about 5 minutes, until dough is relatively smooth. (See photos above!) Note: do not add too much extra flour when kneading - it will make your pretzels tough and chewy, and you don't want that! Put the round dough into bowl that's lightly been brushed with oil. Cover with a tea towel or wet paper towels, let rise for 1 hour. While you're waiting, combine baking soda into a cup of boiling water and let it sit until cooled. 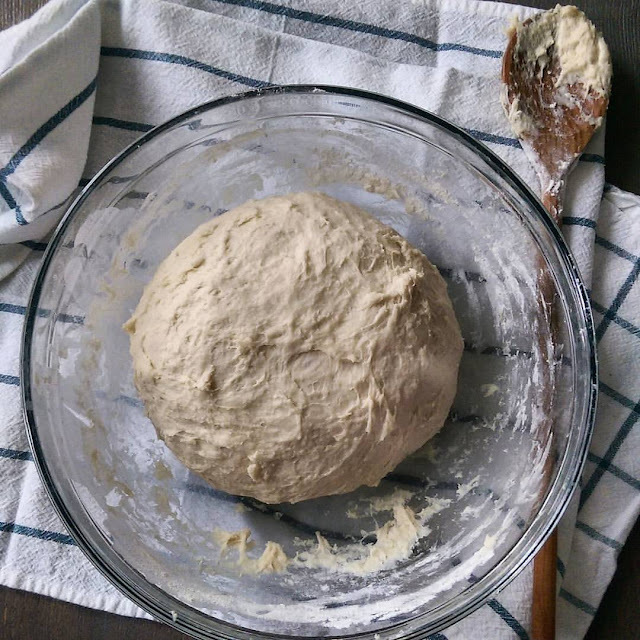 Once dough has doubled in size, preheat your oven to 450F. Turn dough out onto your work surface and cut 12 to 18 equal pieces. Roll each into a long rope, approximately 30cm. 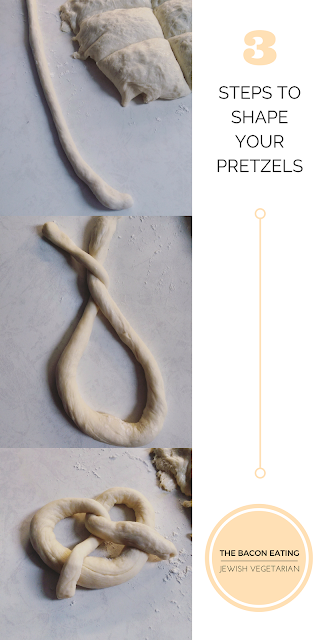 Shape into pretzels (see photos below). Dip each pretzel into the baking soda solution and immediately transfer to a parchment-lined cookie sheet, leaving enough space between each one. Sprinkle with coarse salt. Sesame seeds or dehydrated onion also work well here! Bake for 10 minutes, or until golden brown. Remove from oven and brush with remaining melted butter. Delicious straight out of the oven, or allow to cool and store in an airtight container for future consumption. Note: these also freeze quite well, and are a great after-school or after-work snack that you can pop from the freezer to the oven to heat up and eat! Serve with copious amounts of spicy mustard.